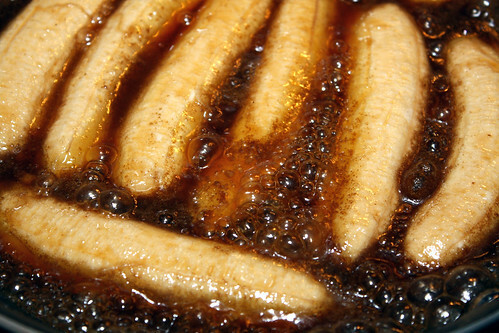 For the last few years, I’ve had an occasional craving for fruit cooked in a rum sauce, but every time I’ve tried, I just get something sweet but easily forgettable (and certainly nothing that I would bother to write a recipe down for). That changed tonight. This entry was posted in Desserts on May 12, 2009 by Chris. 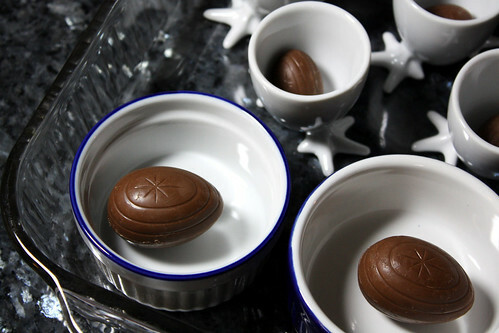 Cadbury Creme Eggs: a guilty pleasure if there ever was one. If they were available all year long, I’m sure I’d be able to resist them, but because they’re so intimately linked to springtime and Easter, it seems almost irreverent not to buy a few each year. I’m one of those people who everyone should be jealous of because I have the good fortune to have in-laws that I really, truly love having in my life. My mother-in-law in particular is an enthusiastic supporter of the blog and sent a request for a blog-worthy contribution for Easter through the contact form on the website. I was very excited about that because it was the first message I got that way! Her request got me thinking about Easter and what I could make. I wanted to do something different, and because I can’t resist a food pun once I’ve thought of it, the Cadbury Creme Brul’egg was born. I bought both normal and mini Cadbury Creme Eggs at the store on Saturday. I also spotted these chicken-footed egg cups at Whole Foods and picked them up because they were oven safe and went with the eggy theme so well. Each of the egg cups got one mini egg, and I experimented with one large egg in two of the four ounce ramekins and three mini ones in the other two. This entry was posted in Desserts, Easter, Featured, Sugar Work and tagged chocolate, creme brulee, Easter, sugar work on March 31, 2009 by Jessica Petersen. Have you ever had a bad baking day? If you have, you’ll know that they can be as devastating as a bad hair day from hell. Most people don’t bake only for themselves. At least, I don’t. I’ve always been very aware of the people I bake for, and I firmly believe that the touchy-feely idea that people can taste the emotions you had while making the food is true. So when I have a bad baking day, it’s almost always when the product is going to someone–or many someones–I care about. On top of that, these people usually know I went to pastry school and was a pastry cook, and so should be capable of making a decent cake. All in all, bad baking days are a dogeared and food-splattered recipe for extreme embarrassment in the cookbook of my life. This entry was posted in Baking and Pastry, Confections, Desserts, Gifts and tagged chocolate on January 26, 2009 by Jessica Petersen.